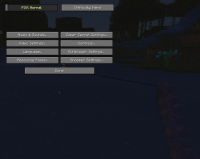 This is especially seen when the fov is high but it is true any time the fov is changed: running, flying, potion effects. To see for yourself just cast a line in your favorite lake and run. I am mostly certain that this has not been addressed before; all other fishing rod problems were much more different than this. MC-102779 Fishing rod string not attached. MC-109882 Fishing rod line isn't well positioned while flying.